A young woman, dressed in an ornate costume, appears to be singing and performing before a massive crowd of people on an outdoor stage. The camera focuses on one particular individual in the crowd, a young man of importance, when suddenly chaos erupts and a billowing cloud of smoke appears near the stage. A large beastly figure appears to loom from within. Suddenly we see the young man leading the performer away at a frantic pace, fleeing to an unknown destination as their captors pursue them. A third person appears, an old woman whose appearance is almost non-human. We soon find out the young woman, Elena, has been cursed and will become a beast if the hero, Aeron, doesn't help her. They reach their destination: Gigantic towers span the far corners of a massive chasm, held together by gigantic chains. We now see that Elena's appearance has changed, for the worse. Her cloak falls, and most of her body now exhibits monster-like skin and even some grotesque, pulsating tentacles. What's happening to her? The camera focuses on an unusual tattoo-like marking on her other back. 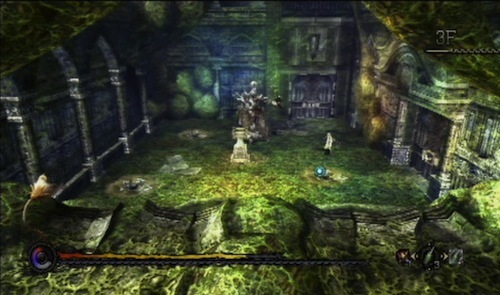 It is with this mysterious opening cut scene that players are thrown into the world of Pandora's Tower. After a long wait and with little hope of the game ever releasing in North America, Pandora's Tower makes a very late, but very welcome, appearance in the Wii library. Originally published by Nintendo, first in Japan (2011), then later in Europe (2012), the game makes its way to America, courtesy of XSEED Games, almost two full years later. Although I was unfamiliar with the developer, Ganbarion, prior to this game, I've come away impressed with their efforts on perhaps the last great game to release in the Wii's lifetime. 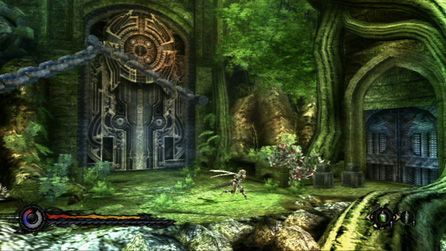 Many gamers heard about this game through the Operation Rainfall campaign, though it certainly may have been overshadowed by the other two games (Xenoblade and The Last Story) in terms of interest and desirability. Personally, I never understood what Pandora's Tower really was about until I actually played it. 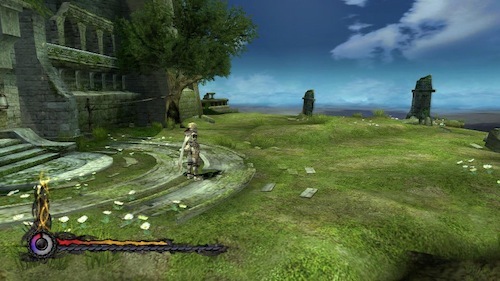 Pandora's Tower is a third person action game with plenty of melee combat and fairly linear progression from one stage to the next, but there's more to it than that, as the game draws elements from a variety of genres to create a wonderful mix that all work really well together. RPG elements come into play as you level up through earned experience points from battles and equip weapons, armor, and status enhancers. There's also a little bit of dating sim elements as you try to strengthen the relationship between the Aeron and his love, Elena. The stronger their bond is, the better your reward in the end. At the far reaches of the world, there lies a forbidding wasteland known as Okanos. Deep within, a vast rift known as "The Scar" blights the land. At its center, suspended above this fathomless fissure are the Thirteen Towers. Towers of all sizes interlink and intertwine, fusing to become one single fortress. Held in place by chains, the Towers loom like a spider in its web. Seeming to inhabit a space beyond the normal world, the Towers serve a purpose; they bind the earth together, preventing The Scar from widening and tearing apart the world itself. The main objective in the game is simple: find and defeat the Master of each of the Towers, take their flesh (yikes! ), and give it to Elena for feeding (oh man!). The belief is that consuming each of the Masters' flesh will lift Elena's curse and return her to normal. The game always jumps into a cut scene showing Elena eating the flesh, and it's a bit unnerving to watch, but thankfully all cutscenes in the game are skippable (if so desired)! Making your way through the towers is a lot like a Zelda dungeon, actually. However, you don't have to worry about whether you have the right equipment or earned an ability yet in order to progress, as you have everything you need from the start of the game. The game does a good job easing you into your moves with real-time pop-ups the first time a particular move proves quite useful in order to proceed. Instead of looking for keys, you will have to make your way into certain rooms to destroy the source of the chains that seal the door to the Master's domain. On top of it all, you must always be aware of the time limit shown as a small gauge in the lower left of the screen. This is essentially Elena's countdown timer that represents her transformation to a beast. This is something you will want to avoid at all costs! Beast flesh coming from normal enemies will reset Elena's timer, so to speak. Destroy the chains that seal the Master's door! OK, but that sounds awful, you might be thinking. No, not the part about the flesh, but the part about the timer: "If I have to trek my way out of the Tower to feed Elena, then trek again all the way back through all the rooms to return where I left off, I just lost valuable time again." The good news is: the Towers feature little shortcuts you should seek out that make it simple to return where you were. A simple example of how this works is dropping a ladder from an upper floor (since you generally start on the ground floor and work your way up in the Towers). I feel having the timer for Elena's demise (which only counts down when you're in a Tower), with no way of slowing it down (unlike Majora's Mask), gives the player a sense of urgency and forces you not to dawdle about for too long. It also makes it more unbearable when you start to get lost in the Tower. The good thing is there are items that allow you to instantly warp out, but these are limited so you can't just use them repeatedly. All this makes for a good challenge that I really enjoyed. The difficulty of the Towers themselves I found quite satisfying, with some occasional frustrations about what I needed to do next. This is especially true on some of the final Towers where the game seems to do a poor job of cluing you in on what you’re supposed to do. Or sometimes, it was too easy to miss something like a ledge you may not have noticed you could reach, thanks to the auto-camera works that sometimes hide things just out of view. The game's story explains how the towers have themes based on the elements (like fire, water, etc. ), so I can understand how some Towers will end up reusing the same theme. Unfortunately, some of the Towers have other similarities as well, and sometimes room layouts appear to be duplicated, which is a bit disappointing. Nonetheless, the challenges are all new, so they still feel fresh despite the appearances. In fact, I really enjoyed seeing the different game mechanics used from one Tower to the next. For example, one Tower's focus may be navigating through skillful use of the Oraclos Chain, while another may be manipulating the environment by hitting different switches. There are even some clever twists in the last couple of Towers that set them apart from any of the previous Towers. Unlike a Zelda game, there's no large world to explore; instead, you have one small, central hub: a resting area called the Observatory where you can take your time and take care of item management, spend time with Elena, and in general just rest. In fact, item management is an important part of the game. You can only hold a certain number of items, though you can upgrade your bag's capacity. You can upgrade your weapons as long as you have the right materials. Some items are for sale, others can only be found within the Towers (and sometimes only at certain times of the day with the 24 hour in-game clock). You can even craft new items from existing ones and discover new recipes. You'll need to balance how you want to spend your money: buy more items for Aeron to use in battle, or buy nice (expensive) gifts for Elena. Elena's happiness is very important too, as you'll come to realize! Just chilling outside the Observatory; shall we head to a Tower? However, the shop mechanic isn’t perfect. The problem is that any item you buy you will eventually be re-stocked, regardless of whether the item is only useful one time only. For example, there’s an expensive item that you can give to Elena so she can upgrade your bag. Later on, you will see the same item for sale again, and you may not remember if you have bought one before or not since the game doesn’t keep track of it. You buy it, then Elena tells you she can’t do anything with it, and you can’t get a full refund! Oops. In general, I feel the game should warn you or remove items from the shop that have no use. Combat is well done and implements Aeron's two main weapons very cleverly: the sword and the chain. 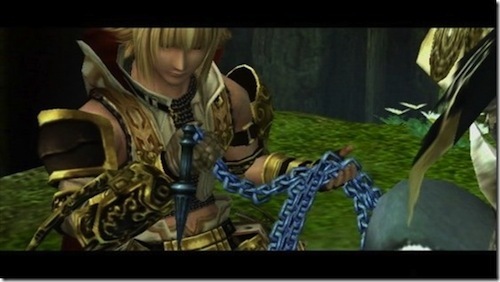 During the game you will actually find two other weapons you can swap out for the sword, but the chain will remain with you always. There's no enemy lock-on; just press the one attack button with good timing when facing the enemy properly. Plus, there are visual clues to let you know the correct timing so you can extend your combo even longer for maximum damage. You can also use items in real-time with a quick d-pad press. The chain that Aeron wields, known as the Oraclos Chain, is central to the game and opens a lot of fun possibilities, both in and out of combat. It can act as a grapple so you can latch on to ledges, and you can use it retrieve items that are out of reach. In combat, you can bind enemies to immobilize them, or even chain one to another. You can swing an enemy around and even point where you want to throw them. With a little practice, mastering the versatility of the chain becomes second nature. Though the game offers a number of different control options, I feel this game was optimized for the Wii remote/ nunchuk configuration,as it works quite well and makes excellent use of the pointer and motion controls. The pointer is perfect for pinpoint accuracy to quickly aim the chain, while the motion controls are used for actions like swinging enemies around (nunchuk) after they've been bound, or tearing their flesh with a quick yank of the chain (Wii remote). These actions don't feel forced or tacked on, and it reminded me that when done properly, motion controls definitely have positive contributions in games when properly implemented and add an extra layer of immersion. The motions feel natural and are easy to pull off. To expand a bit on the pointer controls, they're primarily used to point where you want to fling the chain at, whether it's at enemies, items, etc. I really appreciate a special feature of the chain that magnifies whatever you're viewing and slows down time so you can more carefully pinpoint the exact spot you want to use the chain on. You can even aim the chain at different parts of an enemy's bod for different effects. I love that level of detail and actually having to figure out what is most effective. The Oraclos Chain has its usefulness, for sure! Now I must mention the Masters themselves, i.e. the 'Boss' of each of the Towers. These are the highlights of Aeron's combat prowess, as each Master provides a formidable, lengthy battle, and all the Masters must be approached with completely different strategies, with one common objective: expose the 'Master flesh' (the Master's weak point which they generally protect) and tear at it with the Oraclos Chain. Each Master goes through a long series of changes and are not defeated so easily. These battles alone make the game worth playing, in my opinion. Expect a long, drawn-out fight for the final boss, and be well stocked with healing items! So the game mechanics work very well, but does the story come together just as effectively? Personally, I found the storytelling in the game to be a very compelling reason for me to want to keep on playing, as small tidbits of information and backstory continue to reveal themselves through a variety of ways, including dialogue between the three main characters, cut-scenes after completing each of the Towers that are packed with mystery, and documents strewn about the various Towers (including some written in an old language that Elena is able to translate). I also found the story's focus on Aeron and Elena's relationship well done, especially the way their bond to one another reveals itself as you progress. From the beginning, the player is wondering how close are they really; have they been together for a long time? Even while Aeron is making his way through the Tower, at certain points he will stop and wonder how Elena is doing. 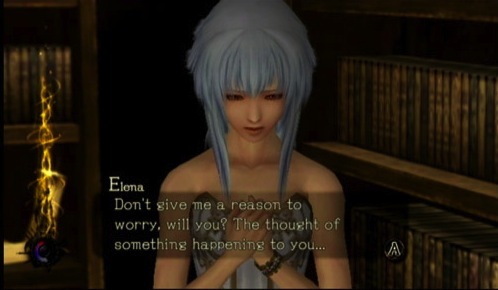 At that moment, the player is given a brief pause while the scene shifts back to Elena, and we see her trying to be as normal as she can be despite the difficulties. We hear her thoughts and frustrations, her optimism for the future, and her affection for Aeron becomes quite clear. Though there are a few awkward scenes here and there that are reminiscent of your stereotypical anime, overall the relationship is portrayed in a satisfying manner to the player without being too much. The game has a great presentation, considering you're spending almost the entire game in the interiors of the Towers and so are rather confined. 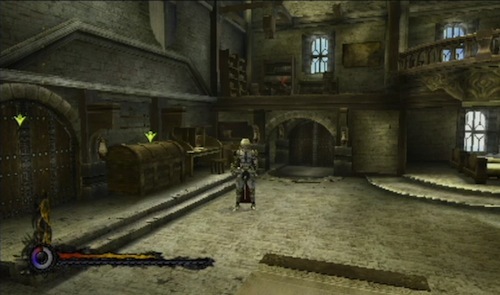 Graphically, the game features some nice effects with color and lighting, but unfortunately some texture work is a little rough and can get repetitive. The graphics certainly are not befitting a Wii game this late in the console’s life. But these faults don’t completely diminish some of the nice environments, such as being pleasantly surprised by some of the little touches of fantasy here and there (like water flowing upward in the middle of a tall vertical room). There's also definitely a gothic feel to the Tower interiors and I couldn't help but feel a sense of Castlevania (in a good way!). One aspect of the game I found less than stellar is the soundtrack. The music sounds great for the most part, whether it’s the soothing music in the Observatory or the dramatic encounter with a Master (complete with chants/ vocals), the quality is there. What’s lacking is the variety. Certain musical themes are used repeatedly from one Tower to the next, and by the time you’re only half done with all the Towers, you’ll likely be tired of the sameness. Another, more serious, problem I ran into is a game freezing bug that apparently is very common in the North American copies of the game. A word of warning: later in the game, when you try enter Tower 11 or 12 and the loading screen comes up, the game will consistently freeze and require a hard reset of the Wii. Fortunately you should be in the habit of saving the game before heading into a Tower anyway, so you shouldn’t lose much progress, but it’s difficult to make progress when you can’t get into the level. There are several documented workarounds that will finally allow you to enter the Towers, but it doesn’t make sense that something like this could have made its way into the final product. Very disappointing; and I can easily see this causing players to lose motivation to finishing the game. After finishing the game at the 26 hour mark and only having a 72% on my file, I know there’s a bit more content to discover (including New Game Plus). 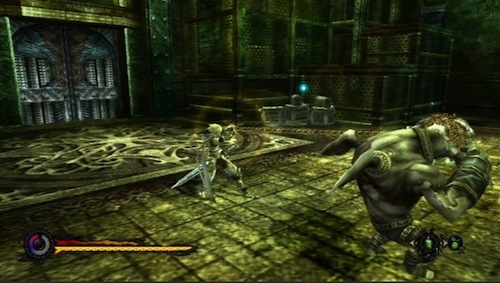 The game features multiple endings (ranging from bad to good), giving the player more incentive to achieve the most satisfying conclusion to the story. I’m thrilled that American gamers have finally been given the chance to play Pandora’s Tower, and I definitely enjoyed my time with it. If only the game freezing bugs weren’t present (they can be dealt with), I wouldn’t hesitate giving it my full recommendation, as long as the beast flesh aspect of the story doesn’t completely turn you away! --"The name of the game, Pandora's Tower, quite obviously comes from the Ancient Greek story about Pandora's Box, where a man opened a box and all kinds of evil escaped, but in that box, something remained: hope. 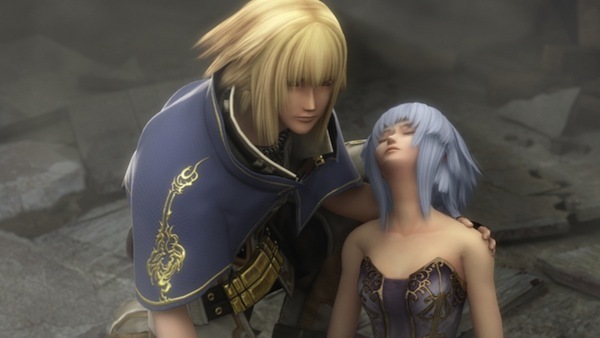 In Pandora's Tower, the Chains in the Towers prevent evil from being unleashed on the world; however, by destroying them and defeating the monster, there is hope for Elena to recover from her horrible curse." --Ganbarion is a Japanese video game company, and the developers of Pandora's Tower. They were founded on August 13, 1999. Ganbarion has worked on a number of games, but until now they mainly worked on Anime, including games to tie in with TV Anime shows. They are most well known for their Jump Star series, but they have also released a few One Piece games based on the TV show. Many of their games have been Japan only releases.